Altura Photo’s all new The Great Explorer Backpack is our top of the line, high capacity, all-in-one DSLR camera and laptop backpack. The Great Explorer has been crafted from carefully selected materials for long-term durability. The main compartment has adjustable compartments to meet your unique needs, storing up to 2 DSLR cameras, 4 to 6 lenses, a flash, and an array of photographic essentials depending on the configuration you choose. Not sure which camera and lenses to choose? Don’t. The Explorer can take you from city to city without forcing you to play favorites. No need to travel with two bags. In addition to storing a ton of camera equipment, The Great Explorer offers the added bonus of allowing road warriors to stash a laptop up to 13″ and a tablet up to 10″. A tripod or monopod can also be secured to the side panel on the exterior using the flip-out boot and attached support strap. And with our detachable rain cover, all your electronic treasures will be protected in the event of a sudden downpour! – Ergonomic, padded, shoulder harness and waist belt provide excellent support and even weight distribution for all day shooting. – Spacious main compartment that stores up to 2 DSLRs, 4-6 lenses or flash, and other photo essentials. – Adjustable dividers can be customized for multiple camera and lens configurations. – Breathable 3D padded back panel for improved comfort in hot weather. DURABLE AND WATER REPELLANT: Water-repellant nylon, heavily reinforced stitching, and expedition-grade harnesses and wide, padded, shoulder straps. ADJUSTABLE STORAGE: 12.5″ x 8.5″ x 18.5″ (L x W x H). 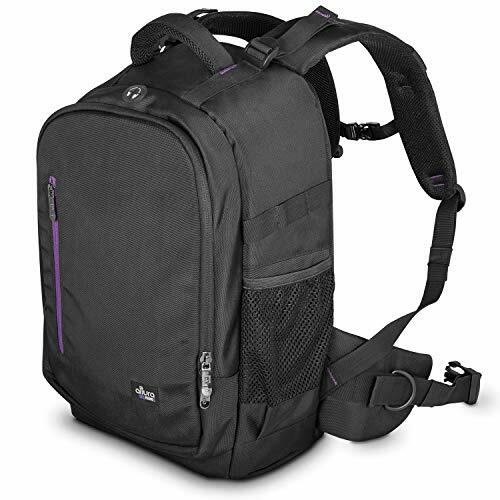 Stores and carries 1-2 DSLR cameras, 4-6 lenses, flash, and other photo essentials in whatever configuration you need. LAPTOP POCKET: Dedicated pockets for carrying 13″ laptops and 10″ tablets. VERSATILE EXTERIOR: Tripod/Monopod storage. Multiple attachment loops for carabiners and other clip-on accessories. Mesh side pocket for water bottle. COMPLETE SATISFACTION: Backed with Digital Goja 90-Day 100% Satisfaction Guarantee.